All Things That Matter Press, publisher of my newly released novel, A House Near Luccoli©, is running an Excerpt Tour beginning October 1st. Many of the authors at ATTMP will be participating in it, providing links back to blog posts containing excerpts of their published works which can then be shared. 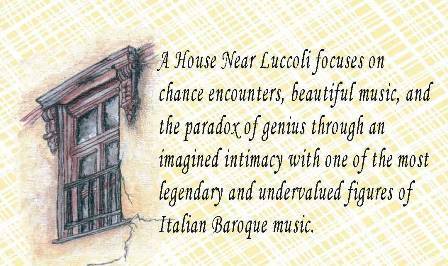 A House Near Luccoli© focuses on chance encounters, beautiful music, and the paradox of genius through an imagined intimacy with one of the most legendary and undervalued figures of Italian Baroque Music. In the middle of the night Donatella rose to a dare and the third floor, bare steps as uncertain as candlelight on an unknown artist’s commission of cherubs and festooned fruits and flowers in muted greens, grays, and sienna. The floor of the apartment didn’t keep her entry quiet but it seemed only her carefulness was disturbed. The trestle table was set up in the salon, too close to the fireplace with its escalloped oak mantle and triangular copper hood illustrating Vulcan and Venus. Windows on both sides were almost hidden by red curtains with gold scrolling around the Garibaldi coat of arms, the moon somehow casting light on the secrecy of her endeavor. She unpacked Signor Stradella’s clothes, carrying the pieces one at a time or in piles to the bedroom and shelves of the wardrobe that threatened to be too small. He has more of what’s necessary and unnecessary than a woman, a much indulged woman. She opened another trunk holding the rewards of beautiful music, smiles and connivances, too, doubtful he carried the family heirlooms while by invitation or escape running around and hiding. Whatever explained the collection, he was aristocratic in everything but bedding and especially fortunate in moveable assets, even indifferent about some of them with silver candlesticks and snuffers, trays, bowls, spoons, toothpicks, and boxes as tarnished as his reputation. Silver wasn’t unusual in a city where even the lowest had the chore of it in their homes, while gold wasn’t to be seen in any ordinary way, and she supposed he took pride in what he had of it, from buttons and medals to a locked tobacco caddy studded with diamonds. She sensed some fraud, too, and quickly deposited a reliquary with the scapular in the chest at the foot of the bed. Otherwise she arranged with an eye for practical and creative importance, or just not knowing where else to put things without cluttering incidental surfaces and the narrow mantle. A candelabrum belonged on the trestle table as did a bookstand and bundle of folders with ribbons untied for a chance of revelation, placed next to a decorated writing slope for composing more than little notes to honorable ladies. Three lutes huddled against the emptiness of a corner, stepsisters born separately of rosewood, maple, and ebony, sharing an inheritance of long necks, head backs, full bodies with rosettes like intricately set jewels on their breasts. Theirs was harmonious rivalry, recalling a master’s touch and understanding. On the settee a leather case contained a violin resembling a dead man on the red velvet of his coffin, not mourned but celebrated by nymphs dancing through vines on the friese high around the room. She hadn’t much time. Until the eighth of June was a deadline through its morning only, four festive galleys already in port, smaller boats gathering the night before with lanterns swaying in unheeded winds and displaying their own regalia. The barges were due to be pulled in and lined up around four in the afternoon so the silks for transforming them into a grand hall wouldn’t fade in the sun that after all didn’t even brighten the clouds. A week earlier, at Despina’s invitation to lunch and numerous glasses of wine, Signor Stradella explained the plan for this divertissement in the bay by drawing little pictures and witticisms from a perverse sense of what made him a living. Donatella was more impressed by him writing slower than he scratched out, biting his hand and grabbing his hair, throwing back his head and closing his eyes. He hadn’t shaved or buttoned his shirt and didn’t seem to remember he had sent for her. She assumed he was speaking to Golone, who set out his clothes for the evening and left with a smile that knew what would never happen. It was as if she had thrown water on him. He shuddered, his back arched even before he sat at the harpsichord to play barely broken chords like a boat rolling on little trills of foam. The mirror now above the console table was as elegant as she wasn’t, her hair less carefully arranged than Nubesta’s, the lace around her neck that might have improved her needing to be washed and starched. 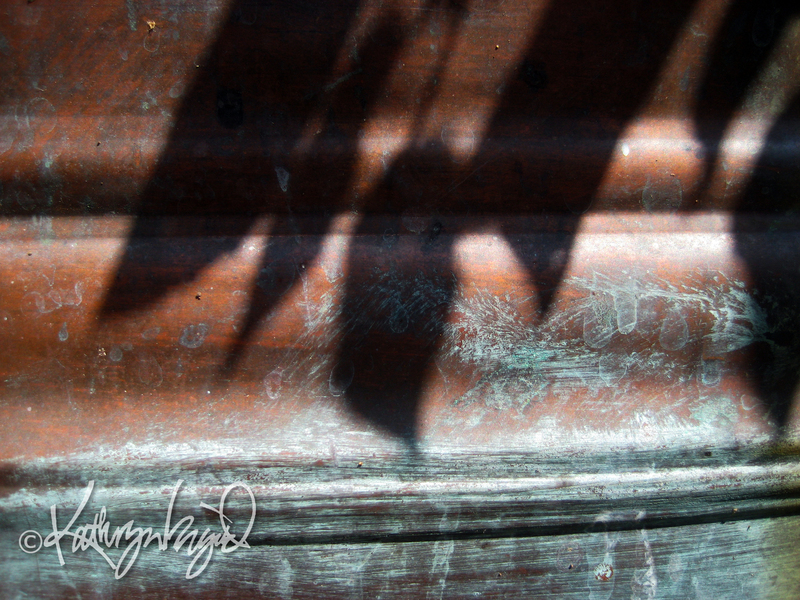 She looked tired from weeks of candles being excessively burned—her hands, too, blistered from the lye soap normally avoided with a long stick in the laundry coppers but desperately used to scrub off stains that had grown beyond her use of quill and ink for writing in a journal. She couldn’t hide her embarrassment as she reached out. “Oh, you haven’t taken care.” He didn’t exactly caress her hands, or merely examine them, either. She stiffened as he showed her. He presented his stained fingers. She picked up her next assignment, feeling unworthy of his gaze. Sleep could never be more important. Now and then Alessandro ventured out with folder and violin under his arm, a bored Golone at his side, and renewed hope that Genova continued to love him it spite of itself. Donatella believed it would because there was no unloving him as he was, available and irresistible, artful yet authentic, larger than life but vulnerable. Making his acquaintance was unforgettable, seduction unavoidable, consequences bestowed like blessings. It was easier to believe he converted assassins than encouraged them and that he meant to fondle hearts, not break them. His wasn’t a minor nobility, with the title Il Maestro di Grande Spirito e lo Stile Fervente, raising voices of angels from the aspirations of singers and offering chances for instrumentalists to perform miracles. So he gave an almost sacred consent to listening for salvation, revealing the purpose of a life not as undisciplined as it seemed. Every note was part of an arrangement between the gifts of God and man, with counterpoints carefully conducting discussions, harmonics cohering different expressions like a rainbow does its colors, language and instruments making passages into the same emotive poety. Yet there was always inovation, interpretation, even impulsiveness and evasion, love never far from its theme, fulfillment not necessary to end with, drama as essential for content as the spectacle of a sunset burning up the sky when it never actually did. Thank you for having the interest and taking the time to read! A House Near Luccoli© is available at Amazon in Paperback and Kindle Edition, and at Barnes and Noble as a NOOK Book. They have appeared again, those autumn crocuses that never cease to amaze me. And so (I have to admit, because I am a little pressed for time, with apologies for all the blogs I am behind on visiting) I have decided to share this post once more. I have added a photograph, taken just this morning, after some heavy rain, so these autumnal burst of spring look a little bedraggled but no less magical. There is a memory here, planted moments before it was too late. It’s not what it seems. These are not the spring variety, waking from frigid dreams, wooed by what is to come, green showing warily yet buds often opening too soon. These are not flowers fraught with anticipation. They’ve already been revealed, lost their clothes in the crowd, withdrawn to regrow and regroup before winter. These latent lilies are a law unto themselves, having done it all before, bending this way and that, exploding unashamed into sunshine and tears, inviting their withering surroundings to dance before the mystery of dying. For here is immortality. Everywhere. And so the generous age offered a handful of corms for drilling into years she might or might not have ahead, too deep to be forgotten. 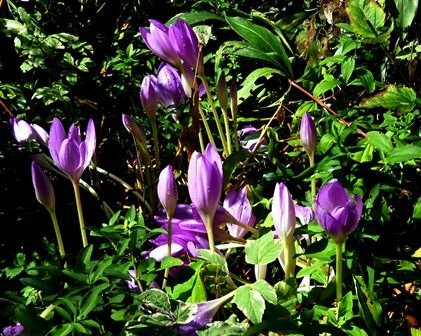 Writing note: The autumn crocus actually isn’t a crocus—it’s in the lily family (crocuses are in the iris family), flowering in the fall. Autumn crocuses send up their leaves in the spring but they die back by summer, the flower stalks rising and blooming quite indecently in fall. 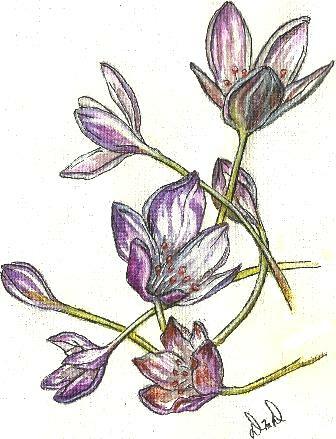 Some common names are: naked ladies and mysteria. Mine were given me many years ago by an older neighbor friend of my mom’s, Sue Drilling, a farmer’s wife, who was fiercely independent as well as extremely intelligent and artistic, living alone into her 80’s (no one knows for sure, as she would never tell her age…) in a large Frank Lloyd Wright style house where she had a very wild but wonderful perennial garden. The new owners have since dug it all up and replaced it too neatly with shrubs and lawns, less to care for and enjoy. Wishing everyone a blessed autumn! This excellent poem by Christine at http://journeyintopoetry.wordpress.com was born out of her personal experience but has a message of acceptance and hope (especially in terms of creating abundance instead of lack). Through everyday endeavors, and with remarkable honesty, Christine lyrically processes her struggles and experiences towards a profound and wise conclusion that many others can relate to and be inspired by. Certainly, she is a constant inspiration to me. you sang for the moon. 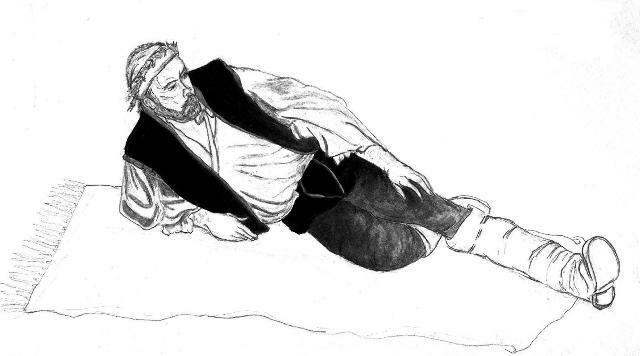 The sketch is of Owain Phyfe, a loved if often distant friend, who was a vocalist, instrumentalist, and founder of Nightwatch Recording which concentrated on Renaissance and Medieval music. He died from pancreatic cancer on September 5, at the age of 63, after only being diagnosed in July. I did the drawing many years ago, intending to make it into a painting. I have decided to leave it unfinished. He has left a legacy of beautiful music. Below is one of my favorites, but please go to YouTube for more examples. And if you enjoy, please consider purchasing one or more of his CDs, which would benefit his dear wife, Paula, and add a little magic to your life as well. Ciao, Owain. Most of us are taught from when we’re very small to avoid all contact with strangers. Don’t look them in the eye; don’t make friendly overtures, don’t speak to them, and don’t go running up and hugging random unknown characters. Above all, don’t accept the offer of candy or other lures from those who might turn out to be very lurid indeed. That figure was the 17th Century composer, violinist and singer, Alessandro Stradella (1639 – 1682). My novel, A House Near Luccoli, published by All Things That Matter Press, is set in Genoa, Italy, imagining an unusual intimacy with him as he tries to sustain his career and escape his demons. You can read a sample at amazon.com and request one sent to you from barnesandnoble.com. I offer a small excerpt here … which I post in tribute to a beloved friend who died yesterday, an amazingly talented and bravely spirited singer and musician (mainly Medieval and Renaissance music) who will never be absent from me. My heart goes out to his beautiful wife and sons, and all those who are missing him so much already. She was caught in a wishful trap, like the first time she had seen him. No, not really the first, for that was from afar and without any intent but to keep him in impossibility. It was when he blew in on scandal and forgiveness, delicate and dynamic, climbing to the top, carrying his fortune, mistaking identities but not character, his heart not skipping a beat so hers found some rhythm again. And from that beginning offered everything and nothing, working and playing, rising and falling, causing concern and relief, making music more important than memories. from love at its best. A few days ago my mother lost her last living sister to cancer. All three are gone now and I know she is deeply feeling the loss of her sibling-family, as diverse and sometimes difficult as it was. I decided it was time to post another of her lovely paintings, and in going through her artwork I came upon this one that I couldn’t remember seeing before, so absolutely delightful and serene. 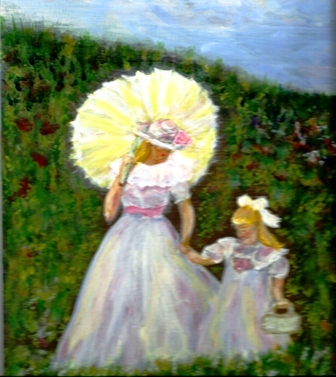 She said she had conceived it as a mother walking with her daughter across the fields to church on Sunday. It prompted a little caption that I hope speaks for itself as I honor her as the best friend I’ve ever had. All she wanted was another day or week or month of saving memories, the cruelty of death not the end of the future but a longer past. Blessings for the best of love to all!